I hope everyone had a wonderful holiday this year! I love seeing friends and family and all the activities that come with it, but I'm glad to get back to a regular routine and get back to my craft room too! I thought I would start the year with something soft and feminine. I have used papers from Graphic 45 and Pion Design to create a card that could be used for most any occasion. I just love this wood frame flourish from Scrapiniec, it makes such a unique focal piece! I got these peach roses a while back in a package of pink toned roses from Wild Orchid Crafts. All of the pink ones are long used and these peach roses are still there because I have no papers that match. So I decided to make the roses the only peach on the card and let them stand on their own, I think it worked. Lots of new laces, fabric flowers and lace leaves, all from my birthday stash from my Mom! I still have a couple dozen laces I haven't even used yet! Thanks Mom, you're the best! It's truly been a Canadian winter so far this year! We had the first white Christmas that I've seen in over a decade and I am just loving all the snow and the chilly weather. 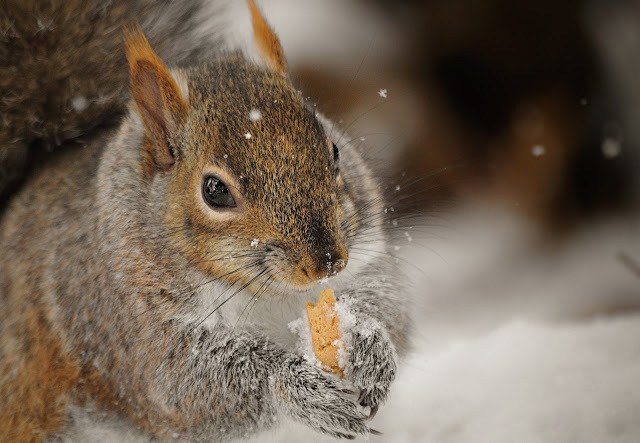 This heavy winter has been very tough on the wildlife though, so I have been extra diligent in making sure everyone gets a balanced diet and has access to stuffing to keep their nests warm for the -30C nights! For today, just some shots left over from last year. 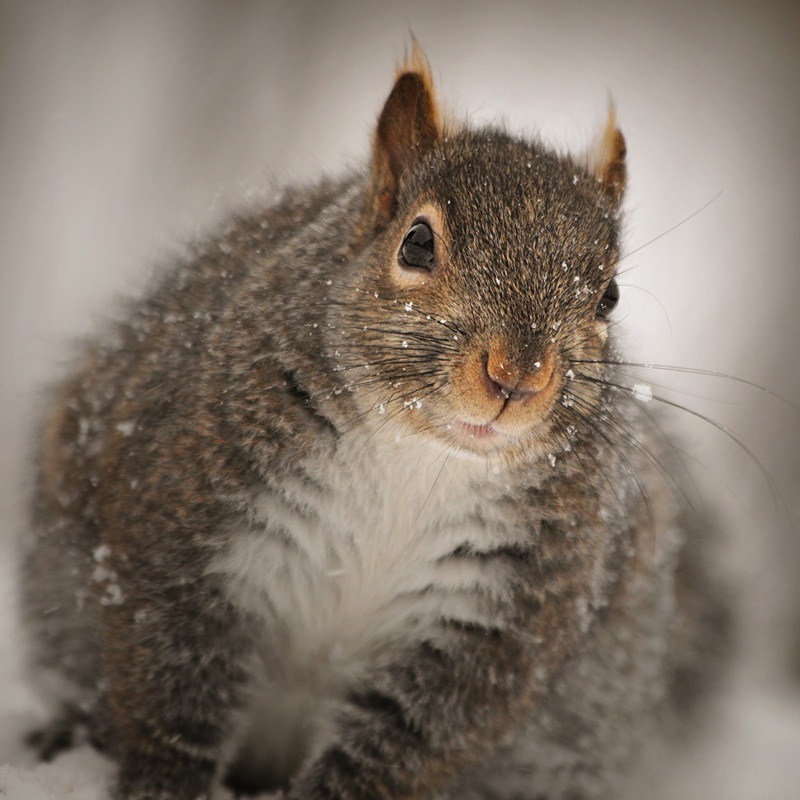 Next post I will have all new photos to share and updates on the sick baby squirrels! Such a lovely card. And missing our squirrels..had 3 siblings and a few older ones and all are gone. We don't know if it is the terrible below temps or what. He puts corn out and it's not been touched. Always enjoy your nature photos. Happy New Year to You and Yours. Stay warm, just thankful we've had electricity to keep us toasty. Happy New Year, Pamellia! May it bring many blessings for you and your family! What a wonderful way to start the New Year off with a bang with this stunning card!Love the laces, especially that 'drippy' one which immediately caught my eye! Your Mom is a thoughtful and generous gift-giver! Please thank her for ME, since I am the lucky one to get to see them on your beautiful cards! Oh, that chippie makes a fabulous focal point with your breathtaking rose bouquet to top it! Really one of my favorites, Pamellia! Thank you for those amazing shots, too! Congrats on getting a white Christmas...I bet you were like a kid on Christmas morning! We actually have a little of the white stuff in the immediate forecast, but sadly, with a raise in temps later, then freezing again, which always spells power outage for us. But it would be so special to see some snow, as we've had to endure some crazy cold temps this past week or two. Sending warm hugs! Happy New Year!! What a stunner this card is and I love that frame too... Amazing photos which always make me smile! Hi Pamellia thank you for your lovely message, glad to here you had a lovely time. Very pretty card to start the year off and I hope todo a bit more crafting as well, did not turn much out last year. No snow here yet, looking forward to seeing all your crafting makes in the weeks to come. Hi Pamellia, Happy New Year!! Loooove your first creation of the year, it's so elegant, soft and feminine!!!! Really the peach roses are outstanding and that wooden frame- Wow!- such great focal point!! All the sweet laces and diecuts are adorable, such great gift from your Mum! I missed your photos in these few days... :) and I'm so glad to see again your furry/feathers friends with their lovely faces :D They are adorable and sweet! Waiting for notices on the sick baby squirrel and hope he is feeling well!! 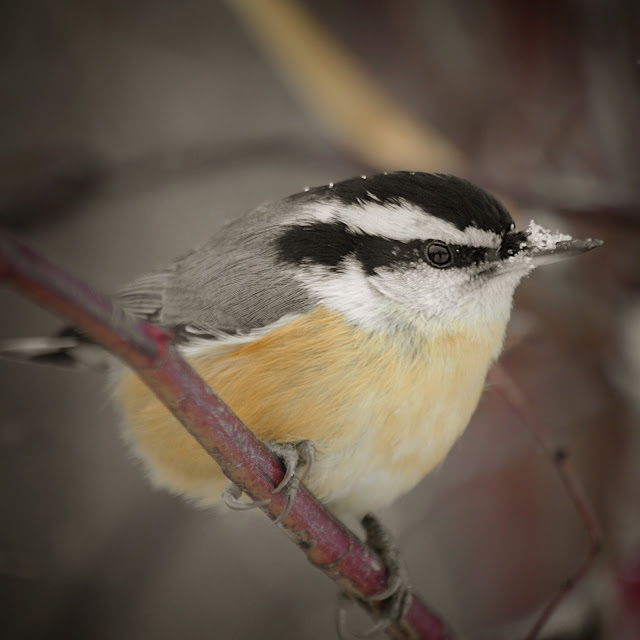 Merci de ce joli post, qui pour commencer l'année, nous offre en plus de cette belle création, des photos superbes de nos amis les oiseaux et de ces si adorables écureuils. Happy, happy new year, my dear friend!! I hope 2018 is such a wonderful one for you!! What a way to start out with this stunning card!! A perfect use of the peach roses!! They look so amazing against all of the beautiful background details!! That wooden frame is amazing!! The laces are so pretty!! It is so elegant and beautiful and I absolutely love, love it!! We had a semi-white Christmas and the snow is still on the ground because it's soooo darn cold!! Though I don't think it's anywhere near as cold as where you are. We did have wind chills in the -20's. The birds are so beautiful!! Mr. Chubb is adorable!! And crazy Karen just makes me smile!! Oh - I almost forgot to tell you this!! I was driving along yesterday morning and saw something huge in a tree. As I got closer, I realized it was a bald eagle!! Oh my goodness, was I excited!! I pulled over and took pics with my cell but I wish I had my camera with the telephoto lens. I almost turned around to get it. It was less than two miles from my house. Now I wish I had. I'm sure I'll never see it again!! WOW! Your card is GORGEOUS!!! Love that chipboard frame and such an elegant floral arrangement. Stunning creation my dear!!! A gorgeous card again Pamellia, the frame is beautiful. 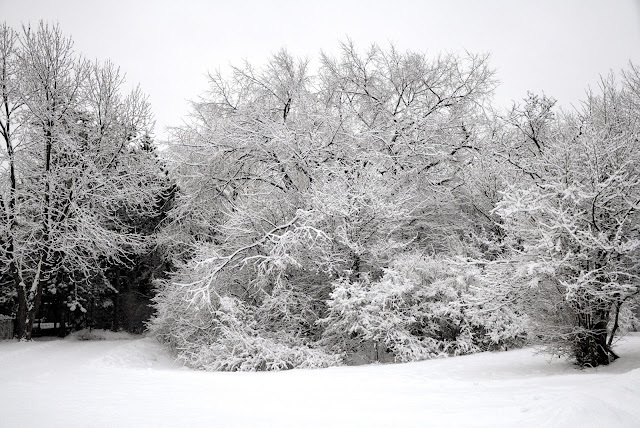 Wonderful photos of the snow as well, it looks so magical. I hope you had a good festive time and I send you my very best wishes for the coming year. Happy New Year Pamellia, wow stunning start to 2018 with your gorgeous card! 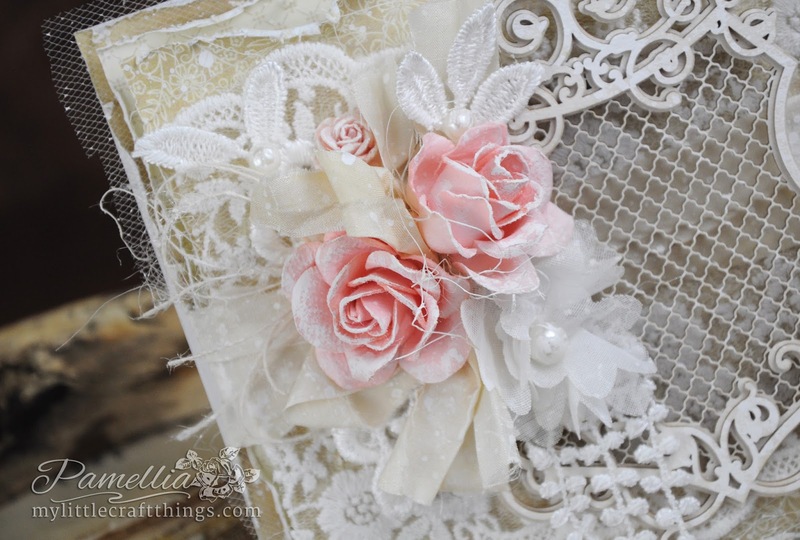 love the beautiful paper layers & laces, perfect roses too. Hope to see your new photos soon and thanks for sharing these. As for your card, it is gorgeous, the peach roses are beautiful and I love the Scrapiniec frame, it is very elegant, as are those papers! Happy New Year to you Pamellia, I hope 2018 will bring you Health,Hapinessand Kindness. 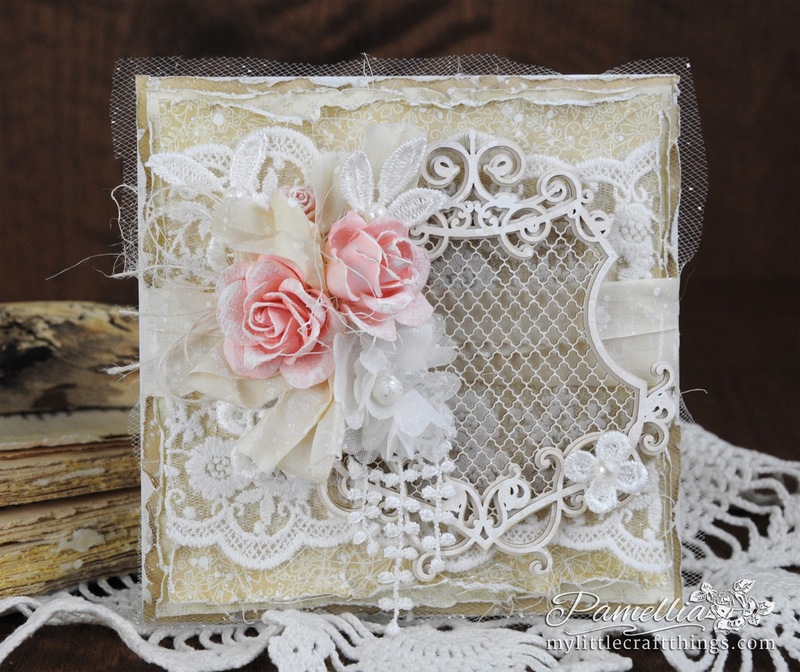 Absolutely stunning design, gorgeous papers and roses, I also love that wooden frame. 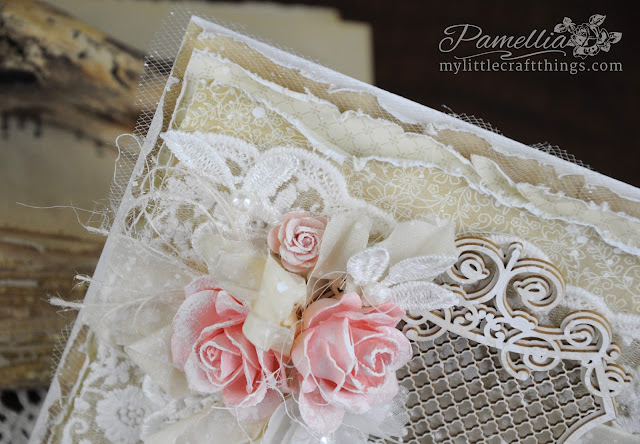 Gorgeous card and laces, Pamellia, and happy belated birthday! We didn't have a white Christmas but we did get a couple of inches of snow before New Year's which is still hanging around because of this frigid weather we are having. The good news is that snow is expected tonight even though we are more on the outer edge of the nor'easter. 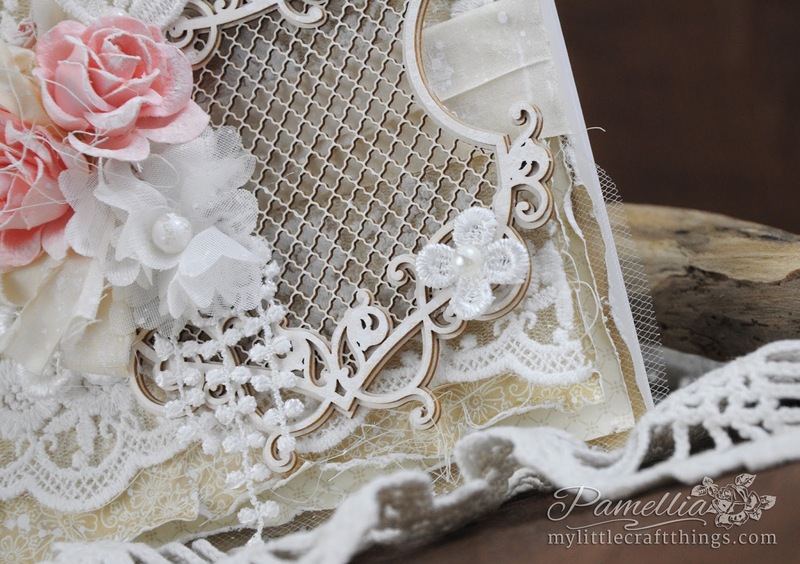 Hi Pamellia, so good to see you back in crafting mood and and blowing my mind once more with the beautiful details and how you put them together on your cards. 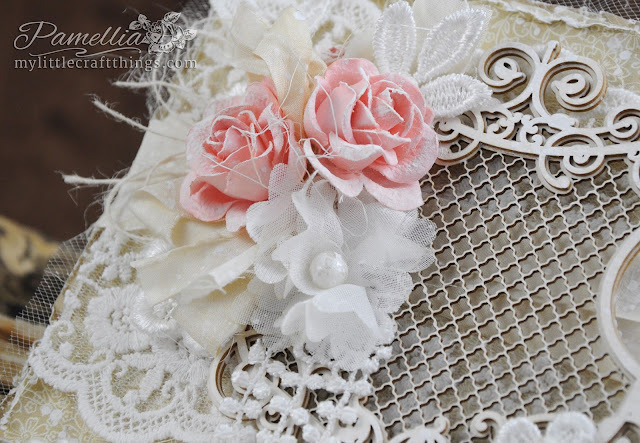 I love the peach flowers and the frame, such beautiful lace ah! Everything. Sorry I was AWOL, most of December. Wishing you and yours the happiest of years. and it's been a weird Christmas and New Year. I love your wonderful and soft card, love all the deets and soft colours. I heard about the tough temperatures in Canada. 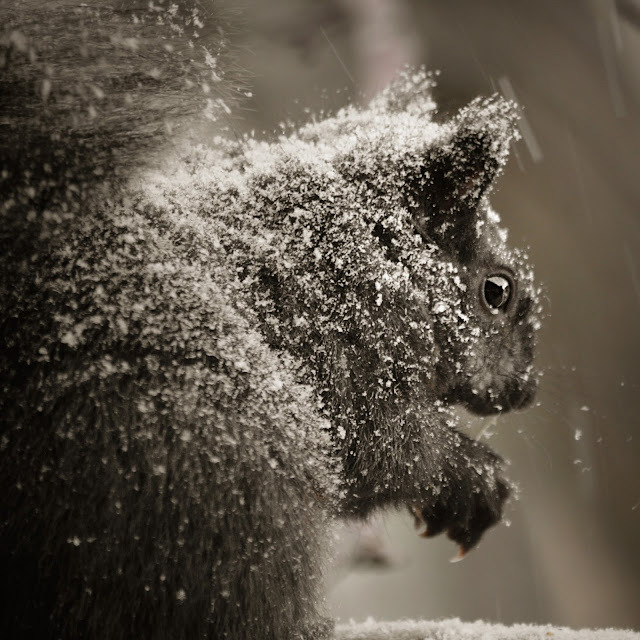 Keep warm and I am extremely thankful you feed the wildlife. Brrr - 30 oC is cold!! Your photos are stunning Pamellia, but that composition is amazing - love that frame, and keeping the roses as the only colour is perfect. Happy New Year Pamellia. 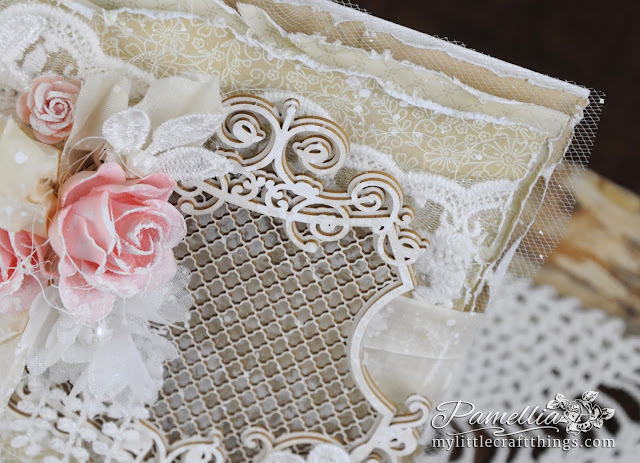 I love the soft colours and delicate lace elements you have chosen for today's card and the pretty chipboard is just the perfect centre piece. Wow and WoW! What a gorgeous wedding card this would make! I love Scappinec products, I have a few myself. So happy to hear your holidays were lovely! yes,yes, time to get busy with 2018! Best wishes in all you do and for you and your family my sweet friend! what a superb creation to start off the New Year. Your design as always is so stunningly pretty and very femine. Love all the gorgeous lace and and elements used to create this excellent card. As always such super photos of your feathered and furry friends. Oh my your weather looks so pretty, but I should imagine you are quite prepaired for that type of weather. I don't think we shall see a white Christmas here for some time. Happy New Year Pamellia, and this is such a lovely start, such a beautiful card. The lace and flowers look absolutely gorgeous and I love the wooden frame. How wonderful to have a White Christmas, but it is hare on the wildlife. Hi Pamellia! Happy New Year!! Sorry I haven't been around much lately but I needed a little break over the holidays! Once again your card is absolutely stunning!! I do love Scrapiniec chippies and wish I could get some for myself but they are difficult to obtain down here in Aus. 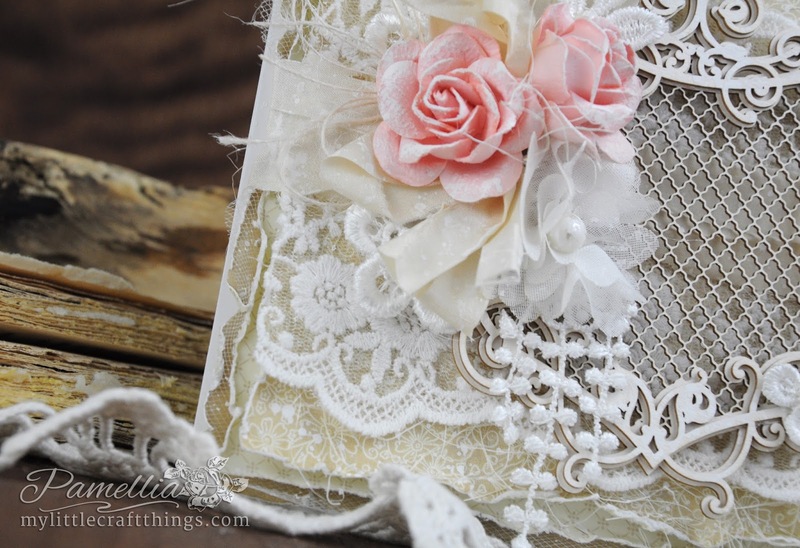 Your peach roses look wonderful on this card and the laces are really beautiful! I think you know by now how much I adore your nature shots .. once again, these are stunning! Your photography skills are simply awesome!! Gorgeous feminine card the peach roses stand out beautifully against the nuetral colours love all the devine lace-we didn't get any of the snow but loads and loads and loads of rain the garden is almost like a swamp!!! Oh my friend, your designs just take my breath away!! This is stunning! So glad you had a wonderful holiday! We did too and I really appreciate you taking the time to stop by for a visit ... so sweet of you! Oh wow, your card is stunning, so pretty. I love the wooden frame and all the beautiful flowers. It is so very feminine and a beautiful work of art. Looks like you have finally got the winter you have been waiting for. The photo of the deep snow looks amazing and I can't wait to see the pictures you have taken this week. Happy New Year my friend, may it bring you health and happiness. Lucky you to have a Mom who knows just what goodies you need to make your hobby sing. The lace on this lovely card goes wonderfully with the flourish & scrolls on this delicate wooden frame - the peach roses are perfect with the white & cream tones of the rest of your card. As always, it's just lush and gorgeous. So enjoyed seeing the birds and critters. 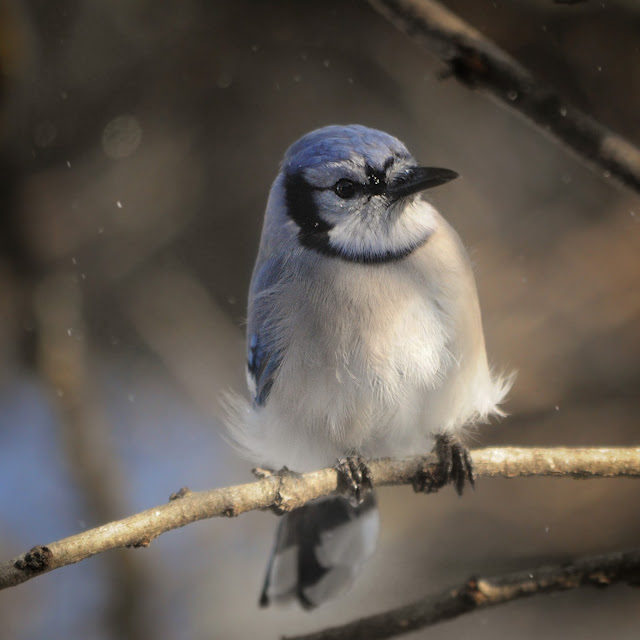 We see blue jays fly, but they don't come to our feeders. We're enjoying some Eastern bluebirds, our brilliant cardinals and we're starting to see the yellow finches. Normally they don't start changing color here until March, but I saw one that was 'primping up' before Thanksgiving. 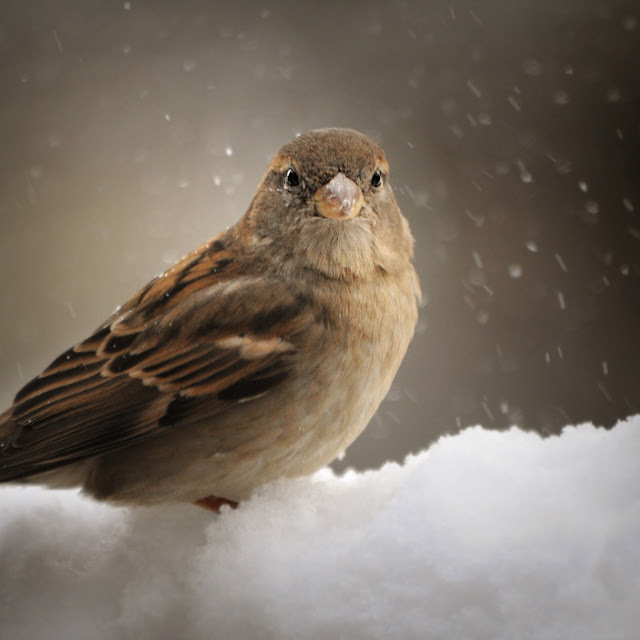 In winter their plumage is a greenish shade of gray with just tiny touches of yellow to tell you it's a yellow finch. Hope you've had 2018 start off great. TFS & Hugs. And thanks for your visit & comment after I'd been MIA so long. Trying to get back in the swing. Your card is just beautiful. I love everything about your card. Great distressing and fabulous fabric roses. Your mom sure knows how to pick out great crafting supplies. Great picture. I love the one of Chubs. 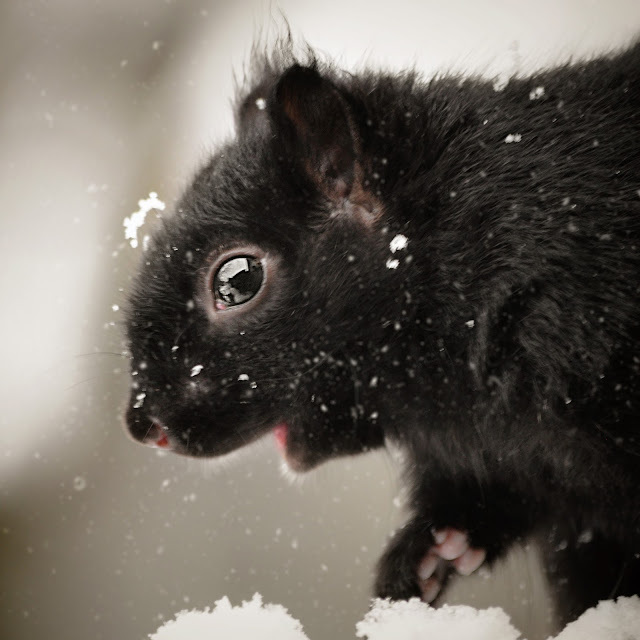 I don't think I have ever seen a black squirrel. Thank you for sharing.